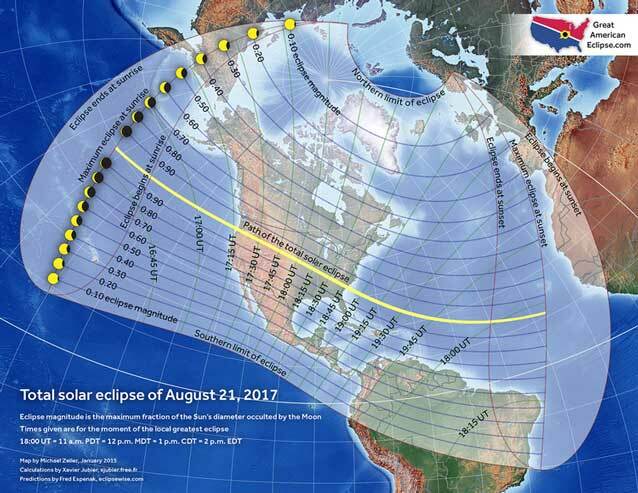 The total solar eclipse of August 21, 2017 almost seems like an eclipse made for the U.S.A. For a land that has not been blessed with totality for 38 years, from West to East, this eclipse shadow path travels the entire width of North America but never touches soil in any other country. It moves from the tide pools on the Oregon coastline, over the towering Rocky Mountains, across the hills and prairies in the American heartland, zooms over the two largest rivers on the continent, the Missouri and Mississippi, up and down the Great Smoky Mountains, across the piedmount and back down to the South Carolina shore and into the Atlantic. On the day of the eclipse, there will likely be hundreds of boats in Bulls Bay prepared to soak in the thrill of totality. This map was provided by Michael Zeiler and is available at Great American Eclipse website. Astra thanks you! This is a great site for information about the eclipse and many links in Astra's Guide to the Total Solar Eclipse will take you to Mr. Zeiler's site when appropriate. Check the Additional Map Links below for more information. The Google interactive eclipse map. The prediction of the umbral path was provided by Fred Espenak. Check the Additional Map Links below for more information. Please consider showing support for these websites by purchasing products or making monetary contributions. This next map is the orthographic projection map of the 2017 total solar eclipse path. A great deal of data is included in this map that has been created and provided by Fred Espenak and NASA. The map can be found on Fred Espenak's Eclipsewise site on the Total Solar Eclipse of 2017 Aug 21 page. There is nothing like the totality of a solar eclipse. For US citizens, this may be the only time that this event may touch their lives. I cannot urge you more strongly to find out what happens when the Sun disappears from the sky in the middle of the day. I had heard that viewing a total solar eclipse was a religious experience. I read that it changed your life forever. I knew that it was a unique event. I wasn't ready for the intensity of my emotions. I didn't know that I would be jumping up and down like a child, yelling at the top of my lungs--Diamond Ring! DIAMOND RING!!!!" Astra's Guide to the Total Solar Eclipse does not contain individual state maps. There is however, a complete discussion of how the eclipse will appear for each state of the US that is along the path of totality. 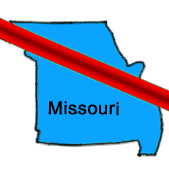 Instead, Astra uses special graphics to illustrate the path through the states such as the illustration here of Missouri. These images were developed from the Guides site logo. Use the Where? 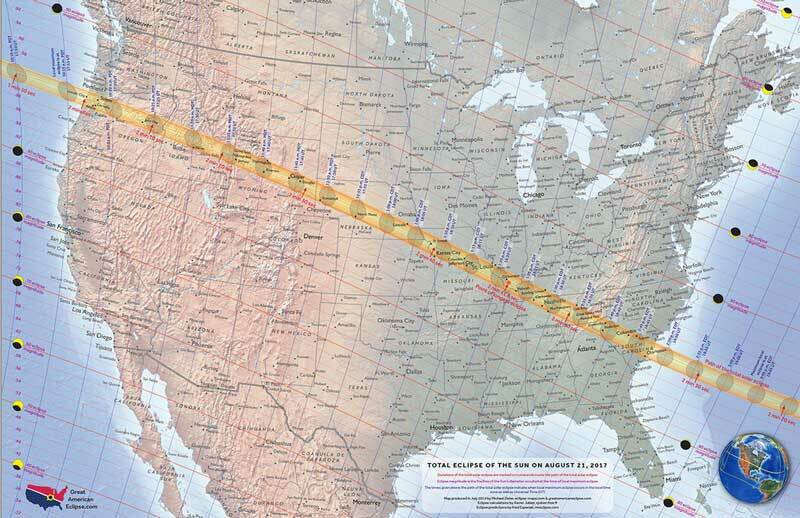 page to find out how the total solar eclipse of August 2017 will affect the states on the centerline and path of totality. The best website for detailed map information on the Total Solar Eclipse of August 21, 2017 is Xavier Jubier's 2017 Total Eclipse Interactive Google Map this map is fully functional. It also has a tool tip that describes the local circomanaces for any point on the surface inside the eclipse path, just click the location and a helpful white info box pops up. The map can be viewed as if from a satellite, as a road map, or my favorite, night view. Night view will reveal how much light pollution is present at a specified location. This is an important concern and communities in the eclipse zone that are hoping for a great experience at totality must be sure to ensure that their night lights don't spring to life due to the light sensors that activate them. An example of the kind of graphic and detail that can be is presented here. Although Astra modified the graphic for this guide, Xavier Jubier provided the app that enabled it. Use Mr. Jubier's red Help Link on the map to get a complete description of how to use the map and explanations for each Get more information on Xavier Jubier' eclipse Page, there is a nice write up on the Eclipse 2017.org page that discusses how to use the map.Xavier Jubier's 2017 Total Eclipse Page and remember that Xavier Jubier provides information of all total solar and lunar eclipse events. Go to Interactive Eclipse Maps. You may like to sign the guestbook or view images that have been submitted to Mr. Jubier on many solar and lunar eclipses. Astra's Stargate is a privately owned website. Please read our Copyright Statement before using any images or text from this website. All images are ©2017 Dawn Jenkins unless otherwise noted.